The event of Connective Cities on “Towards Green Cities in Asia : Managing Urban Sprawl” was held on April 20-23, 2015 by Connective Cities-GIZ and supported by URDI. Surabaya agreed to host this event as part of the Mayor’s innovative effort in developing a green city. There were ten cities participating in this three day event : Bogor, Tangerang, Malang, Jogjakarta, Solo, Probolinggo, Banjarmasin, Cebu, Dortmund, Stuttgard, and Nuremberg. Representative from these cities are development actors (academician, local government, project implementers, and local parliamentarian). The event aims to create a platform of network for urban practitioners in exchanging experiences and having peer to peer consultation on issues that they faced in managing urban sprawl. Dr. Manfred Poppe of Connective Cities-GIZ, opened the workshop by describing the aim and the program of the event and followed by Dr. Delik Hudalah from SAPPK, ITB presenting “Peri-Urban Planning : Managing Urban Sprawl in Fast-Growing Metropoles”. 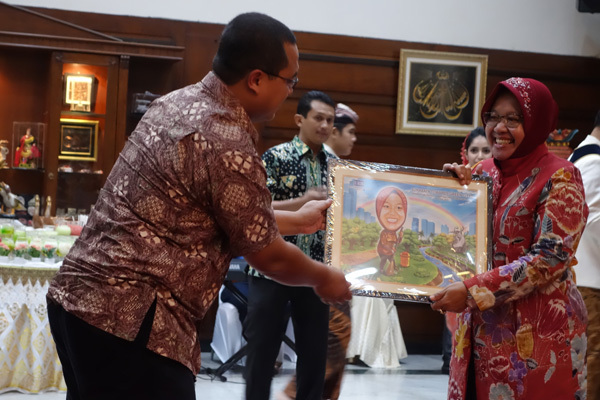 As a keynote speaker, the Mayor of Surabaya presented the case of Surabaya in achieving ‘a green city’ through the development of parks, waste management, and application of e-government. This was then followed with brief presentation from each participating cities, on their issues in managing urban sprawl. On the second day of the event, Putu Rudy Setiawan from ITS presented intergovernmental coordination in spatial planning which highlighted the case of Surabaya inward looking-ness in managing its development. The afternoon session was filled with group discussion and site visit to three locations : 1) Super depo Sutorejo: a waste sorting site (co-funded by a Japanese company); 2) Bratang: a composting house that is adjacent to Flora Park; 3) RW 5, Kelurahan Jambangan: an exampleof self-reliance community in Surabaya that practices waste recycling program and water purifier. The event was closed with analyzing the challenges and finding appropriate solution of the cities using selected tools introduced by Dr. Manfred Poppe. In conclusion, there were four main issues in urban sprawl : 1) Governance : inter-governmental relation, policy and regulation; 2) Planning and design issues; 3) Land Policy : access to land, value/price of land; 4) Infrastructure Planning : construction.